2 roms leilighet type hus, 4 personer, møblert og utstyrt. Fullt utstyrt kjøkken med komfyr, stekeovn, kjøleskap med fryser, vaskemaskin, oppvaskmaskin, mikrobølgeovn, kaffetrakter, vannkoker, brødrister, elektrisk grill, strykejern og strykebrett. Rom med to enkeltsenger. Dobbeltrom. Begge soverom med sengetøy. Bad med dusj, vertikal skap, hårføner og håndklær. Spisestue for 6 personer og stue med peis, TV, DVD og sovesofa som kan være for den femte personen. Egen inngang gårdsplass med utegrill støttet av stein struktur der kull er lagret og / eller tre og dekket området hvor du kan nyte sammen med måltider. Sørvendt balkong med praktfull utsikt over Funchal bukten og utsikt over fjellene i sørøst. Bestående, bord og fire stoler hage, fontene og hengekøyer hvor du kan beundre å se fyrverkeriet årsskiftet eller på lørdagskveldene i juni, eller ta den fantastiske solskinnet som flommer 30 m2 balkong. Uavhengig bad, komplett med dusj, toalett, bidet, vask, speil, kabinettstøtte, hårføner og et førstehjelpsutstyr. Er utstyrt med to sett med håndklær per person. Das Top-Feature dieser Ferienwohnung ist natürlich der Blick auf Funchal vom Balkon! Aber auch sonst waren wir sehr zufrieden, denn die Wohnung hat eine gute Ausstattung - allen voran die kleine Kapsel-Kaffeemaschine (nicht Nespresso!! ), die uns das Leben bzw. den Urlaub gerettet hat ;) Insgesamt ist die Wohnung auch recht gut gelegen (10 Min. zur Altstadt von Funchal - wenn auch halsbrecherische Straßen mit gefühlt 100% Gefälle hinunter - und nur ein paar Minuten zum Botanischen Garten, zum Quinto do Palheiro oder nach Monte). Der Gastgeber Duarte war sehr freundlich und kommunikativ und war von Anfang an ansprechbar bei allen Fragen. Balkon is formidabel, wij zaten er in Januari dus wel wat aan de frisse kant. Appartement is prima, 2 slaapkamers, fatsoenlijke badkamer, keuken met vaatwasser, en nog een binnenplaats met BBQ. Heerlijk genoten hier! On a short solo break my need was basically for self catering bed & breakfast accommodation. I was drawn to this apartment by the photos of the view from the balcony and I was not disappointed. If you go there be on the balcony at around 7-00am to watch the cruise ships arrive in a blaze of lights. I was met on arrival by Duarte who spent time providing me with access, information about the apartment, contact details and a link to bus timetables (very useful if not hiring a car). I felt nothing was too much trouble for him. The apartment is a good size and comfortable. Whilst there were a few areas requiring some minor maintenance (loose fittings in the shower for example) overall the accommodation was excellent. Be aware however that the access from the road is steep if you have any mobility issues. If intending to use public transport around Funchal rather than hiring a car buy a Giro card and load with multiple journeys. Also as the nearest supermarket is an extended walk away factor in buying any food provisions in the city centre supermarkets to bring back on the bus. Though a good way from the centre the apartment is well served by local transport which runs to time in accordance with the published timetable. The journey to the city centre takes about 20 minutes and is an experience in itself along steep narrow roads. And the view from the balcony ......5 star. Thanks Duarte for the hire of the apartment and for your consideration and concern when my return flight was delayed overnight. I was well looked after by the airline but much appreciated the offer to return to the apartment if necessary. I will recommend to anyone travelling to Madeira that they consider your apartment as a base. The view is really stunning, both when it is bright and sunny and at night. If you like boat spotting, this is the place for you! We didn't sit out as much as we had hoped as it rained quite a bit but you can still see the view through the window. We also liked the second rear private sheltered seating area. The apartment was well equipped, particularly in the kitchen, with pots, pans and plenty of useful utensils and equipment. Despite being able to see the motorway from the balcony, there is very little noise and it is certainly not a problem, in fact almost silent at night. The bed was very comfortable, the only issue I had was that the room doesn't black out at night, due to quarter light window at the top on the room for which there is no way of covering. There is plenty of storage in the apartment and it is very spacious. The local bus service is very good so we didn't need a car but were collected and dropped off at the airport by the owner which was very convenient. The nearest supermarkets are a 5 minute bus ride, or a 25 minute walk, away. I would recommend this as a place to stay near Funchal and preferable to the more commercial area at the western side of Funchal. It is very hilly though so bear that in mind if you don't like walking up steep slopes, or hire a car! 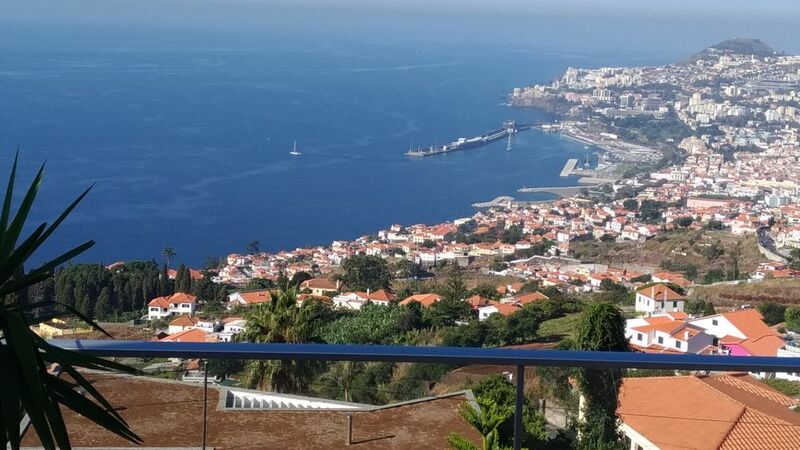 Loué pour 15 jours, nous sommes accueillis chaleureusement par le propriétaire et nous montre sa location qui est très propre et très bien équipé, la terrasse donne une vue magnifique sur funchal et la mer comme sur les photos, malheureusement l'environnement est très bruyant en contrebas le bruit constant de la voie express ainsi que les aboiements jours et nuit d'un élevage de chiens on ternis ce fabuleux séjour, impossible de dormir la fenêtre ouverte, rajouter a cela la deuxième semaine 4 jours de marteau piqueur et de perforateur du a des travaux de rénovation d'un appartement attenant nous obligeant a quitter la location tous les jours sans que le propriétaire ne puisse intervenir faute de présence sur madère, cela fais chère la semaine d'une location dont on ne peut profiter. Madeira er en region med vakre landskap og en veldig mildt klima. Hele øya er det mange turistattraksjoner, inkludert grotter og naturlige bassenger, botaniske hager, på tur i skogen, cruising, fiske, de høyeste toppene på øya, dykking, strand, fjellklatring, monumenter etc. Leiligheten ligger i sognet São Gonçalo i byen Funchal. Byen Funchal er den største byen på øya og har noen turistinteresser som katedralen, vin museum, museets håndverk, Bondens marked, kirker, hager, heiser og mer. I nærheten av leiligheten, har rekreasjonsområder som golf, fiske, dykking, strand, fjell, botanisk hage, etc .. Festlighetene i fylket og de får populære hellige i mai. Ca 3 km fra leiligheten er det også områder av tjenester, inkludert handel, bank og helsetjenester. området rundt er rolig og et drømmelandskap. The rate is based on 2 people. Rate according to the number of people. Discount depending on the duration more than 3 weeks. Downpayment / deposit at the time of booking. Additional charges for cleaning or security deposit may be charged. Keys provided by the owner. Owner not present on site.